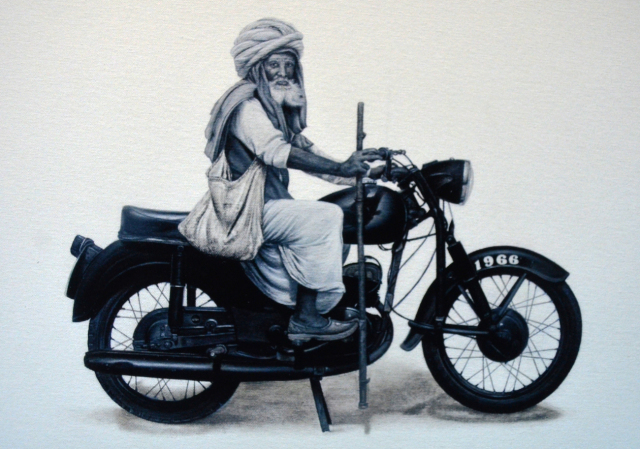 “I was 14 years old when I earned my first penny, 30 Bucks for a sketch. 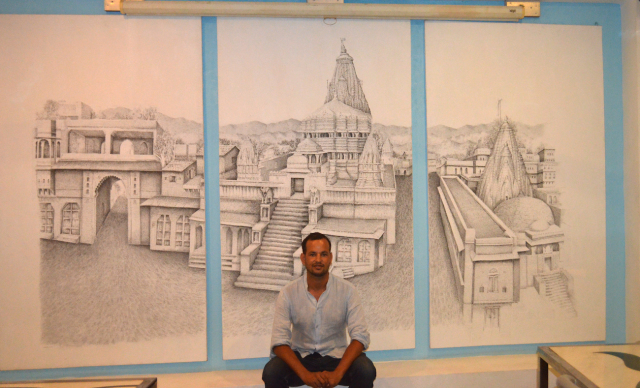 For me it was a moment of pride and motivation to continue my work.” says Rajesh Soni as he opens up about his life and career as an artist. 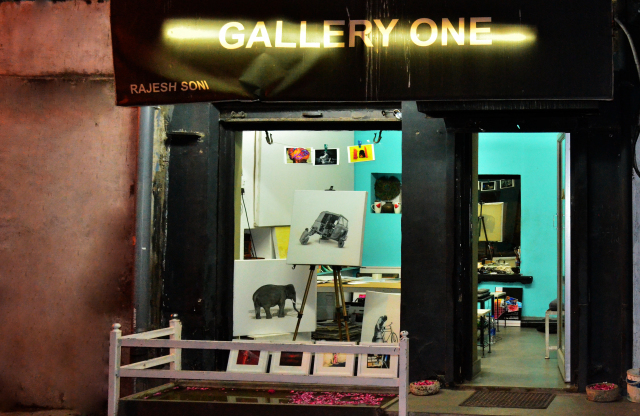 It was a warm evening when I first met Rajesh ji at his gallery “Gallery One” located near Chandpole. Featuring a beautiful waterfront with petals floating in it and his latest works displayed behind the glass wall, the first look of gallery was quite captivating. Even though it might not be as big as other art galleries “Gallery One” has a subtle aura to it that’ll attract you towards it. And adding to this aura with his charisma and friendly personality he welcomed me into his gallery. As we walked into the gallery I began scouring it when my eyes stopped on a canvas covering an entire wall of the gallery, wondering what it was for? 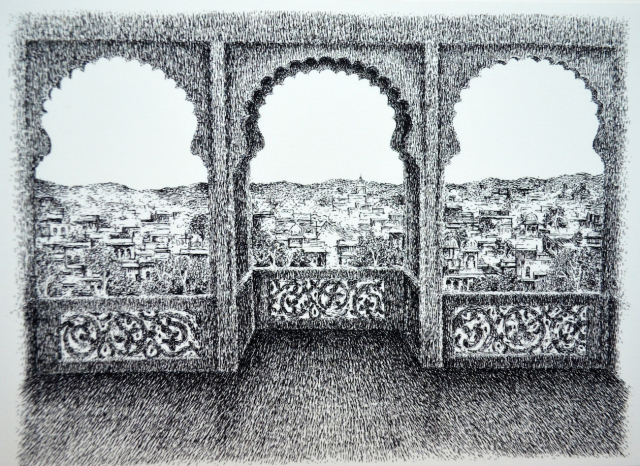 As I scoured further; his alluring and amazingly detailed sketches, paintings and other art works got my attention. A work table, a vintage camera, a floor lamp and other artefacts added creativeness to the Gallery One. This was the time when a question began to tickle in my head. You must have had a deep connection with your father since early years. Did your entire family supported your career choice? You are a very lucky person to get support from your family especially in a society where so many dreams are crushed by family only. When you started it must have been a bumpy ride learning to do things, building audience, choosing what to sketch. What was the best comment you ever received? You are world famous for your hand painting skills and I can clearly see that your talent cannot be caged into just one style. It is wild, free and always ready to explore new dimension. What was the first idea that you stumbled upon? Did you had any idea then that this little adventure of yours is going to make you world famous? Where could we see your hand coloured photos? 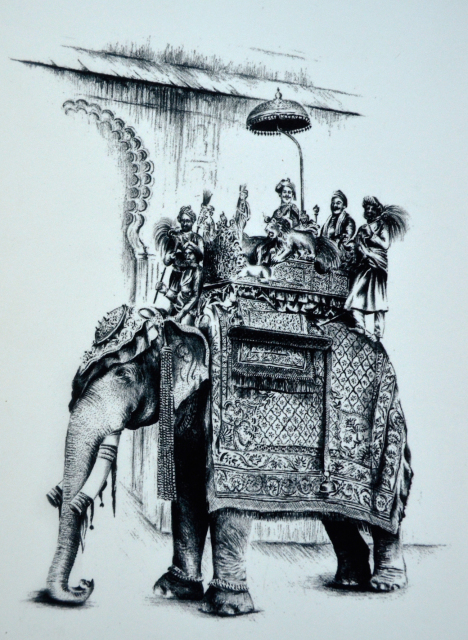 Apart from the “Men of Rajasthan” you can also see his hand coloured photos and other artworks at Madri Haveli. 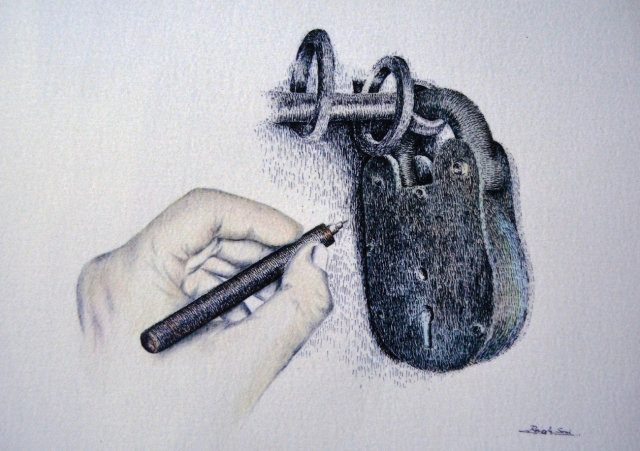 Starting as a person with passion for art you have climbed up a long road. During all these years you must have had your own ups and downs. It is really wonderful to see that 14 year old boy in you still alive. Which one painting of yours you love the most? How did you manage to stay motivated and focused all these years? What is your secret? I would steal this para to say to everyone reading this to do what makes you happy. The journey might be bumpy but being happy with what you are doing would make it easy and an incredible journey. Signor there is so much more to you than just hand colouring which made me knock on your door. 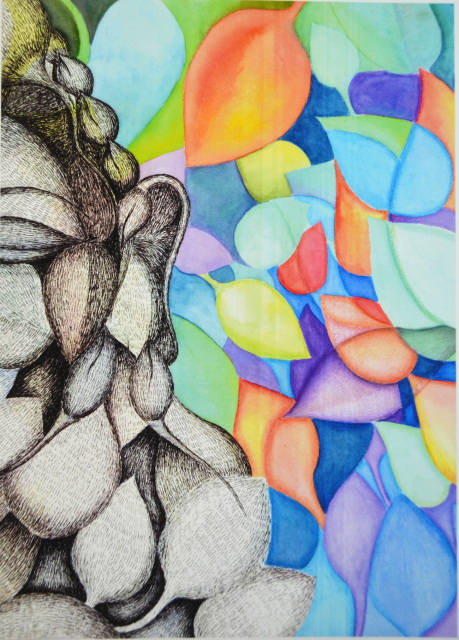 The things you are doing are really mind blowing but It is also true that you are just a petal in this flower of art. There are so many amazing artist around the world even in our little city. How do you manage to stay creative and unique in your field with so much competition? Wow! That was inspiring. Despite being educated till 10th you have wisdom than a college graduate. 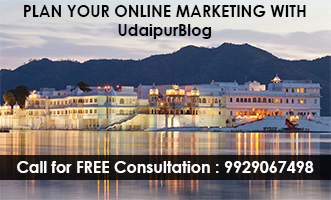 Would you suggest young artist to take professional degree? How you first used your skills? 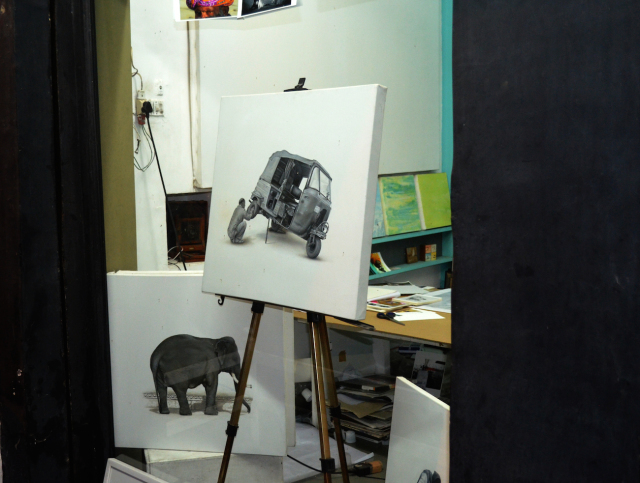 The glimpse of the same genes can be seen in his younger brother’s work too. While he is still a young fellow his talents did leave us amazed. He currently works with paper modelling and have created a wonderful and detailed model of a bike. 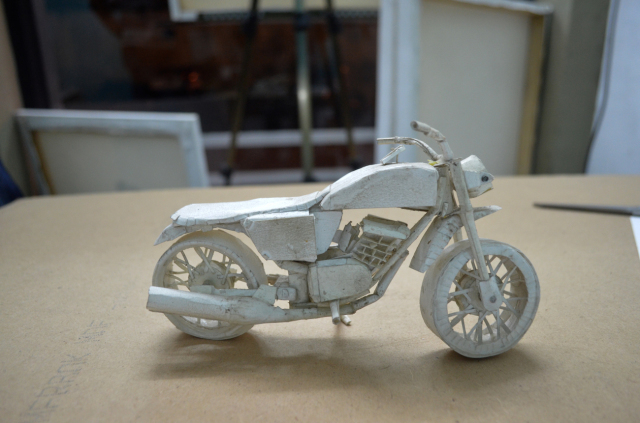 Paper Bike made by Rajesh ji’s brother. With this we left his studio and went on a little road trip to see his currently displayed works where we continued the interview. How long did it take complete this? “8 months” he replied with a smile. 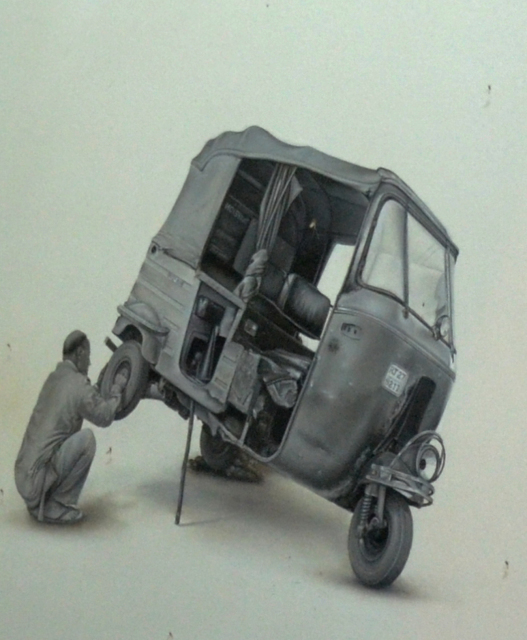 What was your most challenging work till date? You do both kinds of work commissioned and free will. What do you have to say about your clients? What would say about their support? 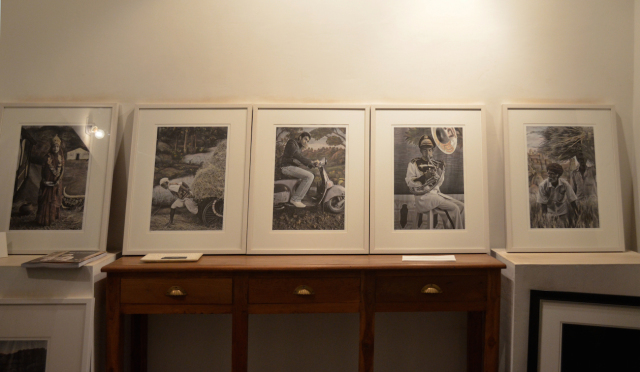 Then we went over to Madri Haveli where his hand coloured artworks were displayed. City of Lakes is undoubtedly blessed with world class beauty and world class talents to capture it. 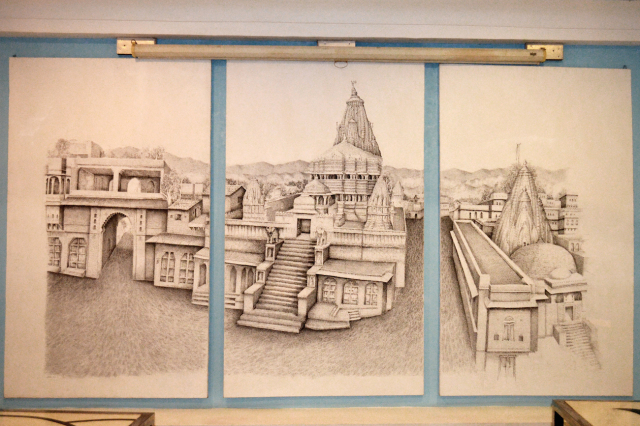 Before we met Rajesh ji the only thing we knew was that he is a brilliant hand colourist but now we are captured by his amazing talents that would leave you too amazed. Wishing him best of luck for the future. We bid him adieu! Thank you Pooja. I too hope to delight you with more good work. Wonderful interview.. keep up the work Nirbhay..
Truely an inspirational story !!! 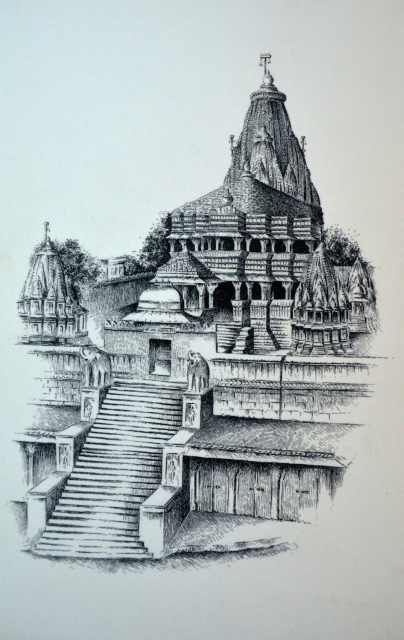 Dear Rajesh, your sketch work is fascinating and of high quality. 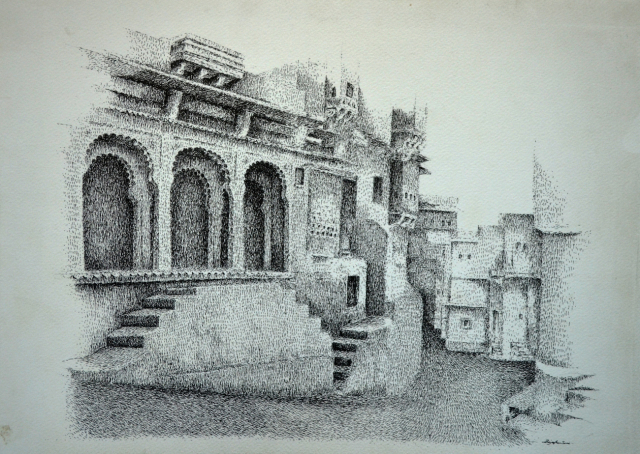 It also appears that for drawing sketches your selection of the technique and method suits the aura of the built heritage of Udaipur. I twice visited the city but found that lots of undesirable additions have been made in the last 50 years that have caused not only visual encroachment on space but also become an eye sore. 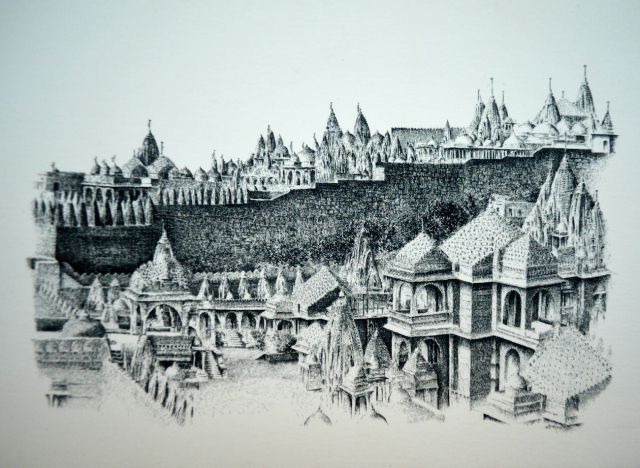 The freedom that an artist can utilize is that he can still capture the natural and pristine ambiance of the monument or a building in which it was originally placed. 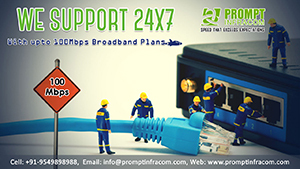 Kindly provide your contact number, email ID and mailing address. 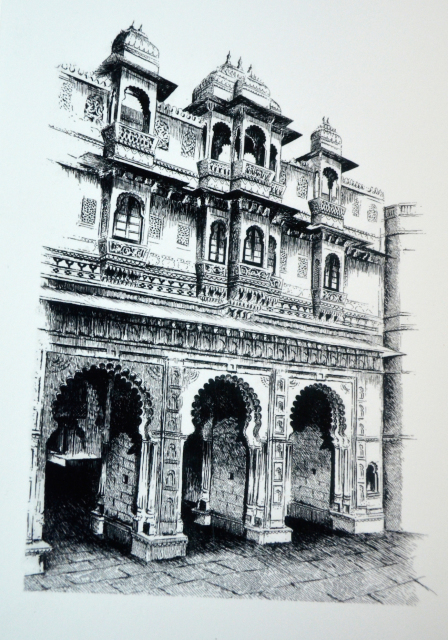 I am an author and may need your skills to illustrate my books on Rajasthan that are in the pipeline.